Takahashi FSQ-106ED @ f/5.0 (530 mm F.L.) Captured at 3.5 arcsec/pixel. Shown resampled to 16.8 arcsec/pixel. 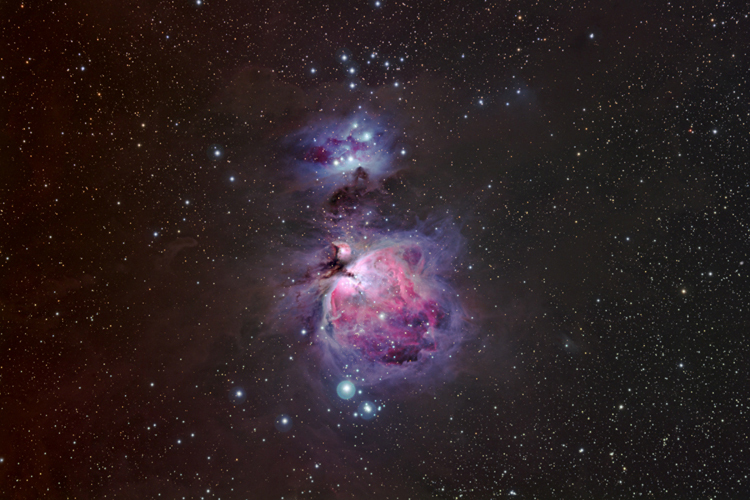 The Orion Nebula (also known as Messier 42, M42, or NGC 1976) is a diffuse nebula situated south of Orion's Belt. It is one of the brightest nebulae, and is visible to the naked eye. M42 is located at a distance of 1,270±76 light years and is the closest region of massive star formation to Earth. The M42 nebula is estimated to be 24 light years across.